After exploring a couple of alternatives to the granddaddy of URL shorteners, TinyURL, I had been planning to write a post about why these services are important and what are the advantages and disadvantages. When I found out yesterday that Ragan.com had an article (including a video interview) from a presentation I did in October at SAS in Cary, NC as part of Ragan’s corporate communications conference, I saw a good opportunity for a real-world, practical demonstration of how these services work. And of course, when you paste a link like that into an email, for instance, what typically happens is that the URL is broken, so that when the recipients of your email click the link they get error messages. By reducing a 215-character URL to 25 characters, it meant I could paste the shorter version into an email (or into Twitter) without worrying about a broken link. It’s brilliantly simple, really. With a six-character string of letters and numbers, TinyURL can create over 2.1 billion URL options. So when you submit a gigantic URL, TinyURL generates a random six-character code and links it to that URL in a table. Then, when users click that TinyURL link or enter it into a browser, they go to the TinyURL site, which looks up the longer URL and redirects them to the original longer URL. See the Wikipedia article on TinyURL. BudURL – This service has a free option or a paid upgrade that gives you access to statistics on how many times your BudURLs are clicked. I’m just using the free option, which I think limits me to 25 BudURLs. It also has a browser bookmarklet, which I will describe in the SnipURL discussion. Adjix.com – This is an interesting one in that it is ad-supported and offers revenue share. When people click your adjix link, a new browser window opens with a narrow ad banner. I think it’s relatively well done and the ads aren’t annoying. Here’s an adjix.com link for this post (which will create a recursive loop). What do you think of the ads? Annoying or OK? NotifyURL.com – Similar service to some of the others, but you get an email the first time someone clicks your link. More recursive fun. Linkbee.com – an ad-supported platform like Adjix. I like the way Adjix incorporates ads, as opposed to Linkbee, although Linkbee does give options. The interstitial ads show up for a few seconds (with the option to skip like some of the newspapers use), and there also is a banner option. What do you think? 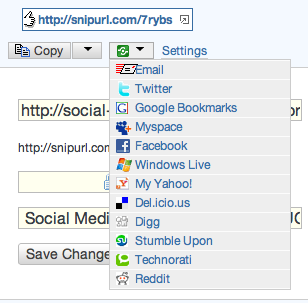 TinyURL, SnipURL and BudURL offer browser bookmarklets, which makes the URL shrinking much faster and easier. TinyURL is actually automatically incorporated within Twitter, but I’ve found that it doesn’t always work. Adjix says it has a couple of bookmarklets (and even has video demonstrations of how to use them), but I can’t find the bookmarklets anywhere on its site. Any of these seven tools will do the job for you. One potential downside of them is that if you use them instead of your long URL you may not get the Google/SEO benefit of links, because the link is to an intermediary site instead of your own site. I’d appreciate hearing any thoughts you have relating to these services, or others like them that I haven’t reviewed. Please add your thoughts and reviews in the comments, so all SMUGgles can benefit from your experience. I like bit.ly at the moment. Tried is.gd, which may be the shortest of all, but it seemed to give Twitter problems. So I’m sticking with bit.ly. I like bit.ly for the ability to see how many people have clicked my shortened URL over time. 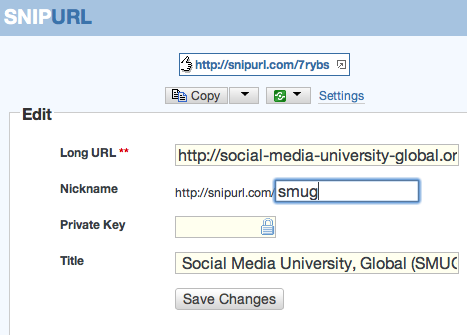 I use BudURL’s free option for my URL shortening and currently have 35 URLs. I’ve tried several shorteners, but found BudURL’s detailed analytics to be the most useful. This is great! I have always had a problem writing these long URL’s so this helped alot! I’ll have to try this sometime. My favorite one is tinyURL because it seems simple and easy to use. Some of the other sites can up with error messages or had too many fields to fill in. I have never heard of anything like a shortening-URL site. Quite honestly, I don’t copy-paste URL’s very frequently right now, but it could be useful to me in the future. I wonder if teachers will use this for references page? It is so annoying to post 2 or 3 lines of URL. The adjix link on this page doesn’t even work. That is kind of ironic. Actually, the majority of these links are not working for me. In general, I’m not a fan of ads. I’ve never had problems with links being broken when I sent them in emails or anything like that, but I guess this could be a useful tool. I don’t know that I would use it, but I understand that many people would. DwarfURL is not appealing to me. It seems like it might be more complex than I would like. I like tinyURL in that it is really simple. Linkbee and NotifyURL also seems like good ones and NotifyURL has the feature of letting you know when someone accesses the link, but I’m not sure how important that is. I don’t think I would care much. I guess I would use TinyURL if I used any of them, but it really doesn’t seem that appealing to me. I have never tried these before, but I plan on giving TinyURL a try! These services are so helpful. They make sharing URLs a lot easier. I didn’t know that these types of services even existed. What a great way to be able to shorten URL’s! Thanks for the instructions! You’re welcome, Katherine…I’m glad you are finding the curriculum helpful. this is such a good idea. i wonder why this didn’t happen earlier. i need to use this for references on papers. I had no idea this even existed! It is so helpful! Thank you so much! what the heck? who knew you could do this. k super pumped about this! Awesome course! I had heard of tinyURL but I never new what it did! thanks for sharing! I did not know about this! Awesome. I dislike ads.